Every automaker and car start-up is currently working on the same technology, and now two tech behemoths are pitted against one another. Waymo, the self-driving car project of Google, filed a lawsuit on Thursday against Uber that alleges one of its former employees stole the proprietary design of Waymo’s self-driving car system. According to the 28-page complaint filed in a California federal court (which is available below), Waymo says a former manager of the self-driving car project, Anthony Levandowski, downloaded more than 14,000 “highly confidential and proprietary files shortly before his resignation.” The files—about 9.7 GB worth—included a design of Waymo’s LiDAR circuit board, which is key to making the system function. In the run-up to the alleged theft, Levandowski informed colleagues that he planned to set up a new self-driving vehicle company, and Waymo alleged that he “appears to have taken multiple steps to maximize his profit and set up his own new venture” before leaving the company in January 2016. That venture was what’s now known as Otto, the self-driving truck company that launched in May 2016 and was soon-after acquired by Uber a few months later for $680 million. Waymo was recently – and apparently inadvertently – copied on an email from one of its LiDAR component vendors. The email attached machine drawings of what purports to be an Uber LiDAR circuit board. This circuit board bears a striking resemblance to Waymo’s own highly confidential and proprietary design and reflects Waymo trade secrets. As this email shows, Otto and Uber are currently building and deploying (or intending to deploy) LiDAR systems (or system components) using Waymo’s trade secret designs. This email also shows that Otto and Uber’s LiDAR systems infringe multiple LiDAR technology patents awarded to Waymo. Waymo claims that, in December, an employee received an email from one of its LiDAR-component suppliers, that had the subject line: OTTO FILES. The email, according to the complaint, included an attachment of a machine drawing of “what purported to be an Otto circuit board that bore a striking resemblance to — and shared several unique characteristics with — Waymo’s highly confidential current-generation” LiDAR circuit board. Suspicious that Otto and Uber were using Waymo’s design, the company filed a public records request to the Nevada Governor’s Office of Economic Development and Department of Motor Vehicles, and obtained an Otto filing submitted to Nevada authorities. In one document, filed just weeks after Uber purchased Otto, the self-driving truck company privately told regulators that it had “developed in house and/or currently deployed” an in-house custom LiDAR system, according to the complaint. 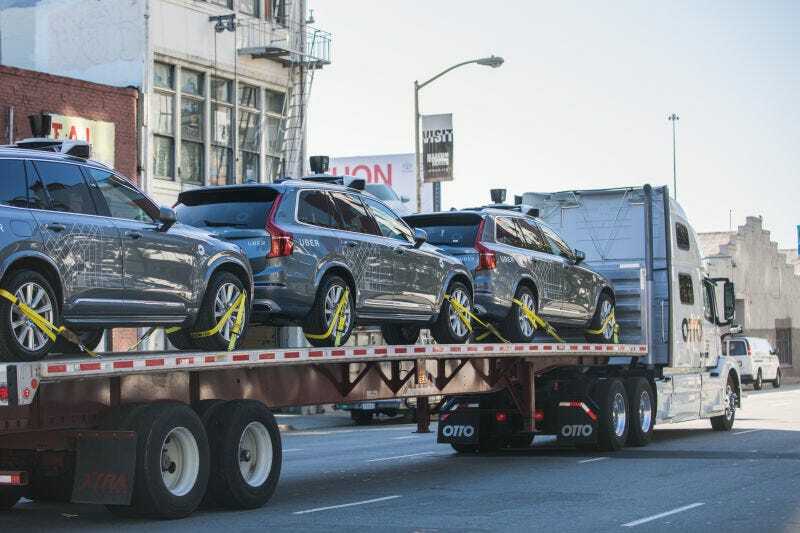 “This was the final piece of the puzzle: confirmation that Uber and Otto are in fact using a custom LiDAR system with the same characteristics as Waymo’s proprietary system,” the complaint says. “We take the allegations made against Otto and Uber employees seriously and we will review this matter carefully,” a spokesperson said in an email. LiDAR is ultimately crucial for how self-driving cars can function; the technology works in tandem with cameras attached to the car to detect the vehicle’s surroundings and help the autonomous tech function properly. Waymo throws some serious shade on Uber and its ambitions to get into the self-driving car market, saying as of last August, it had “no in-house solution for LiDAR — despite 18 months with their faltering Carnegie Mellon University effort — and they acquired Otto to get it.” Woof. “The facts outlined above and elaborated further in this complaint show that Uber’s LiDAR technology is actually Waymo’s LiDAR technology,” the complaint says. Waymo is asking the court to issue an injunction and thereby block Otto from using the allegedly stolen information. This wouldn’t be the first high-profile suit over the alleged theft of self-driving tech. Last month, Tesla filed a lawsuit against the company’s former manager of its Autopilot function, claiming he stole company documents and attempted to recruit employees to a new venture. The self-driving tech wars have begun, everyone.